Last week on S.Y.T.Y.C. we had an outdoor themes projects. Mine was “Bringing Outdoors Indoors”. 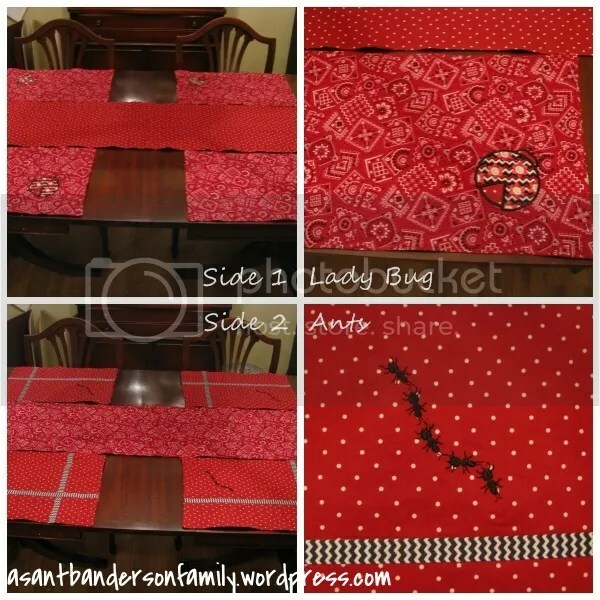 I made a reversible table runner and placemats with embroidered ants on one side and an embroidered ladybug on the other side. I was excited to finally use this ladybug appliquéd but my kitchen has ladybug decorations in it. 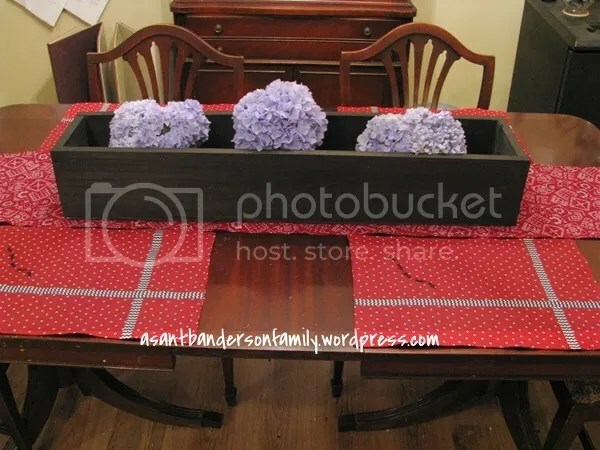 I choice the colors that I did for the table runner and placemats because it reminded me of a picnic quilt. Adam helped me make the center piece for the table. I wanted some wood that looked really weathered and what better than the weather wood from our fence that got blown down a while back during a tornado. The wood was warped so it helped with the weathered look. Then I stained it with some ebony stain and the next day sanded it. I don’t completely love the flower vases I got to go in it. They are too short. So I need some taller vases for it. 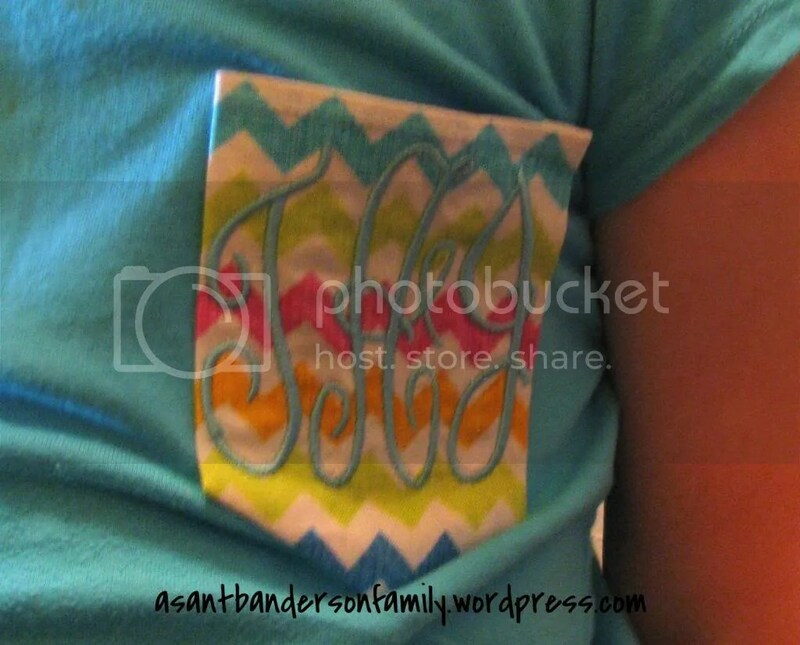 I have debated on stenciling “Anderson Est. 2011”, but I am not sure with the stain being so dark. Don’t forget to head on over to S.Y.T.Y.C. and vote for your favorite around the world project!! I know this is rather late, but with four kids in the middle of summer my life has been rather busy and time to blog had taken a back burner. Partly because it drives me crazy that some of my stuff is ASANTB and some of it is Sheena Creates. So I have debated on changing my blog and I have been thinking about going to self hosting but it so loses me. Anyway, that is all for another day. 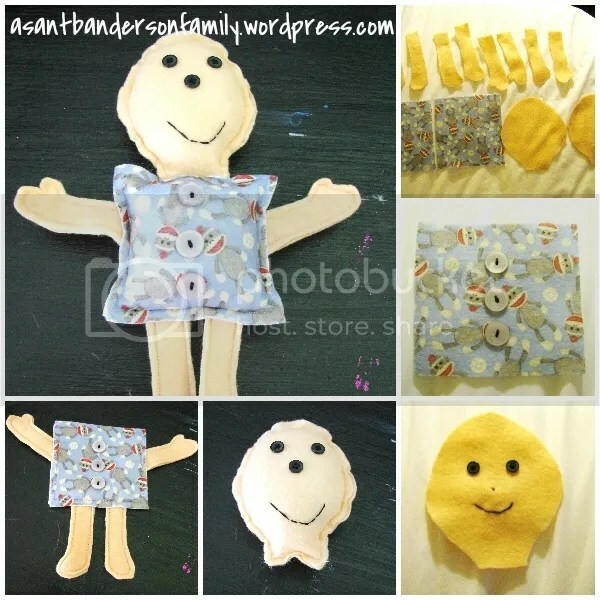 For my kids can do project on S.Y.T.Y.C., we made felt people. 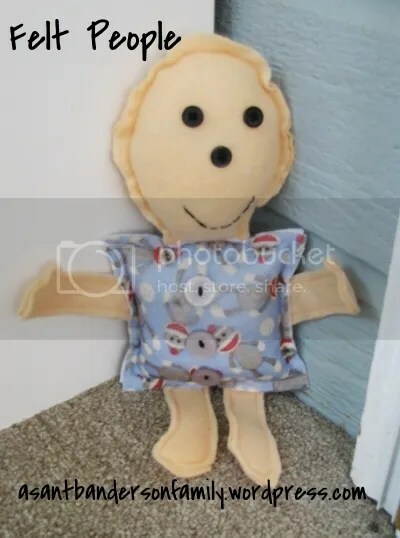 This was something that started in my head as stuffed animals and as I was thinking about my pattern decided people would be better. The kids and I went to Hobby Lobby and picked out felt and buttons for their people. I was hoping we would have had a chance for them to finish theirs before this post, but between traveling, Alyssa’s birthday, work stuff and the holiday we haven’t had a chance. But I am glad I made Bradley’s before I let them make theirs because I made changes to my plans along the way. After they make theirs I’ll do another post with a tutorial. Don’t forget to head on over to S.Y.T.Y.C. this week and vote for your favorite around the world project!! 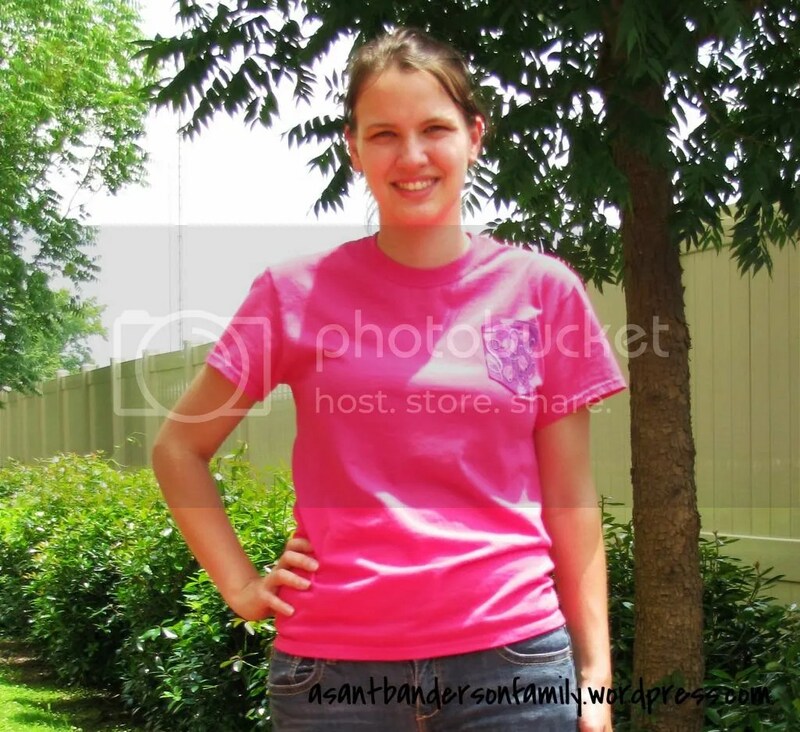 Are you looking for pocket tees? 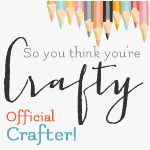 Make sure you check out Sheena Creates on Facebook. I now have them available. There is a limited number of them available at this time so make sure you get them before they are gone. Currently I am selling them using the fabric from the post I did recently here and here. 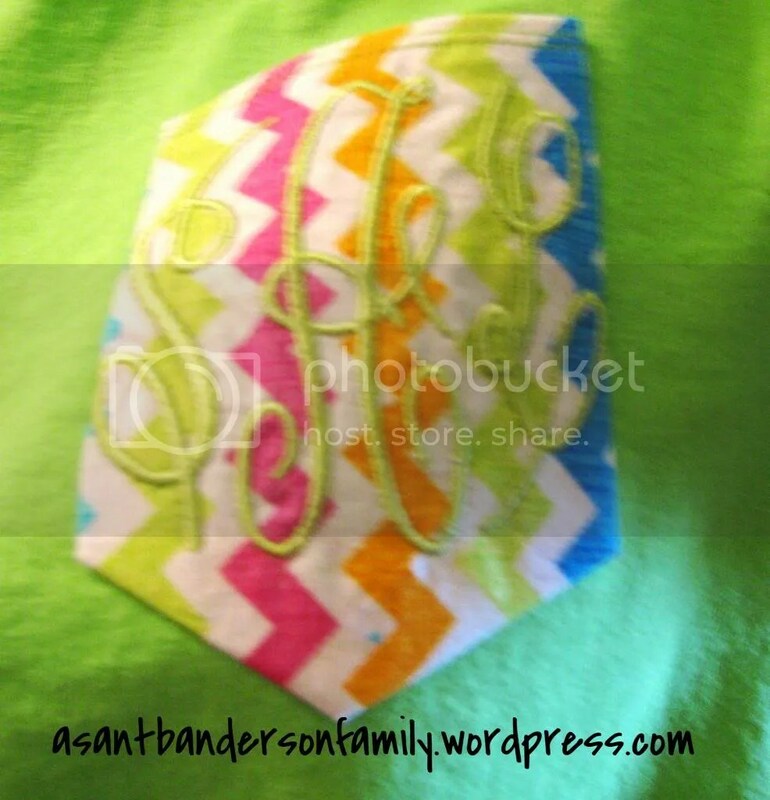 The next monogrammed outfits the girls and I wore was the green, pink, orange and blue chevron print. It has a name but I can’t remember what its called. I LOVE this fabric and so wish I had of bought more of it than I did. Hopefully I’ll find some more of it. Please excuse my lack of photography in this picture. I had children with rather shaky hands helping me in taking the pictures. 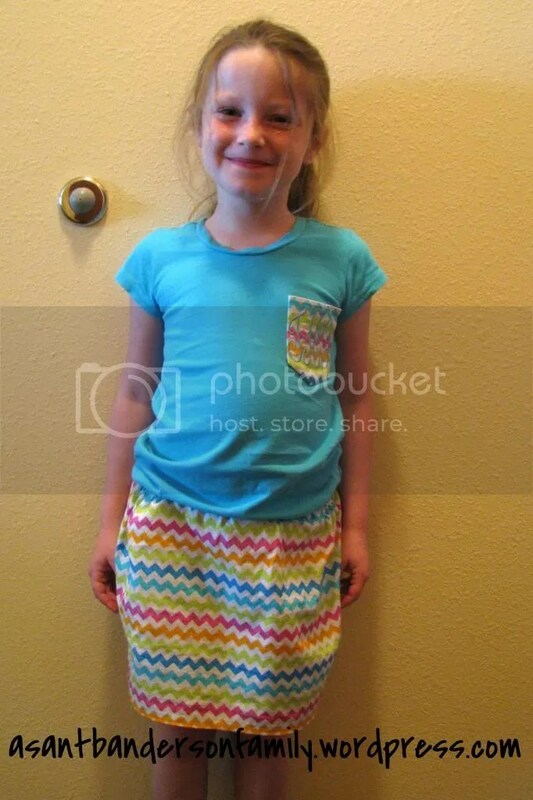 With this fabric I made both girls a skirt and I made all three of us a pocket tee. Last summer I bought two light blue t-shirts for the girls that I never used. One is now to small for either girl and one fit Taylor perfectly, so I used it for this outfit. 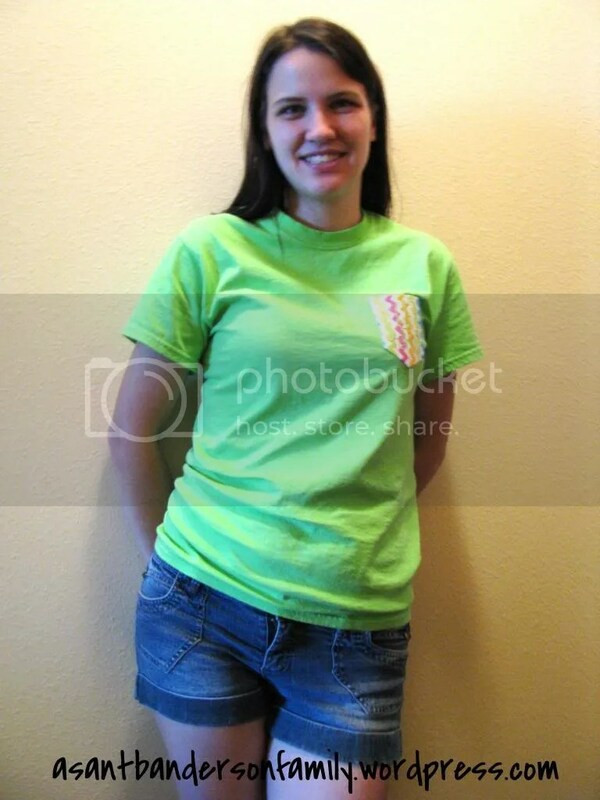 A while back I bought a lime green t-shirt for Alyssa and I had yet to use it so I decided to use it for this outfit. When I bought a bunch of t-shirts for myself I bought a green one which worked out perfect for this outfit. 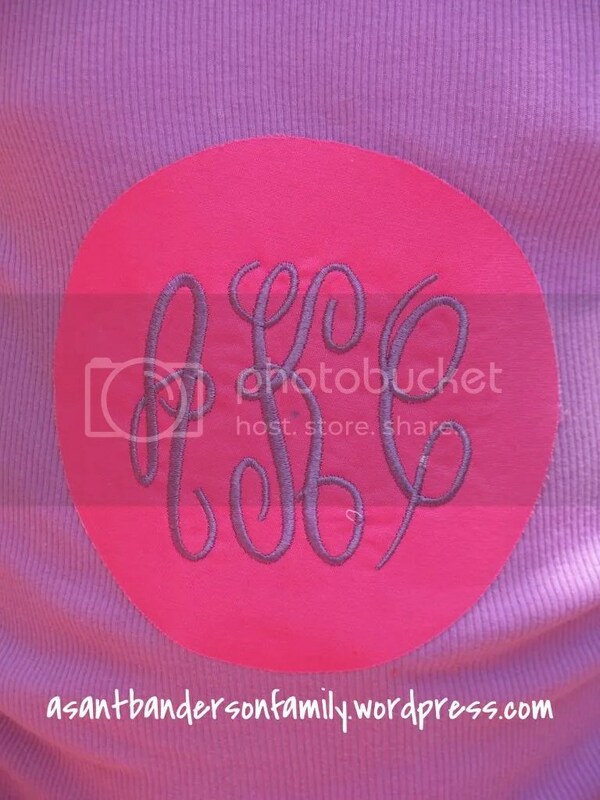 A few weeks ago I did a lot of sewing one Saturday and in that sewing I made a lot of matching outfits with monogramming for the girls and myself. Over the next few weeks I am going to feature these outfits on here and I will be offering some pocket tees on my Facebook page for sale from the fabric that is featured in each of these post so make sure you check it out because there is limited fabric and once its gone it may be gone forever. 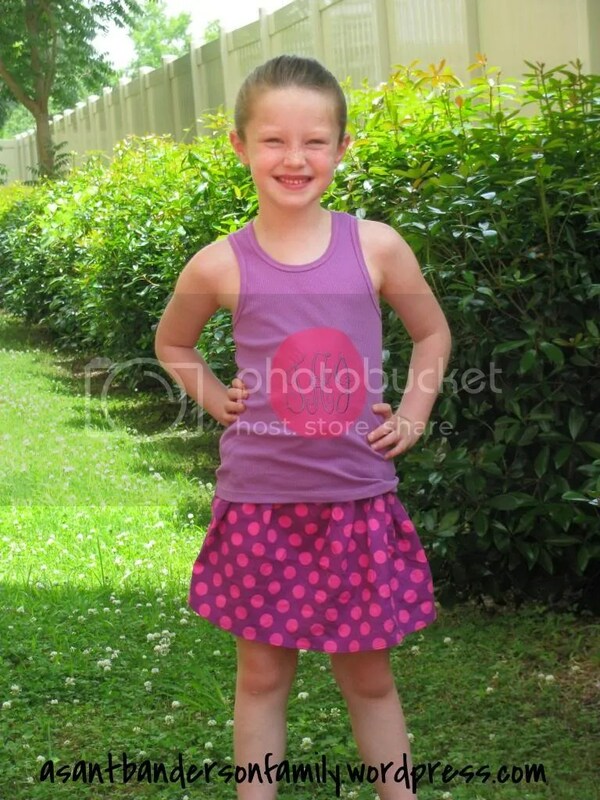 The first outfit the girls and I wore was the purple with pink polka dots. I bought these tank tops for the girls months ago and I never used them. 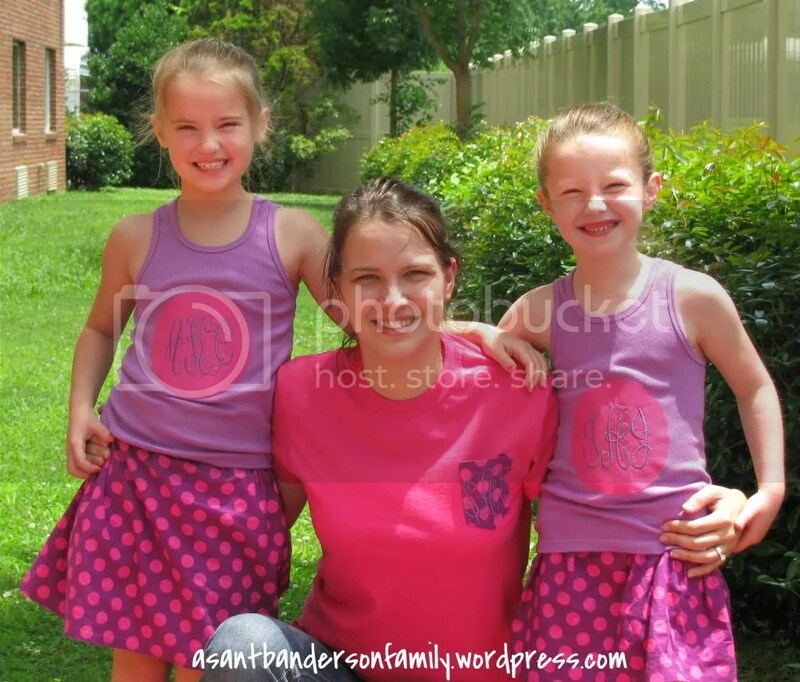 When I saw this fabric I knew it would be perfect to make them matching skirts with monogrammed shirts. 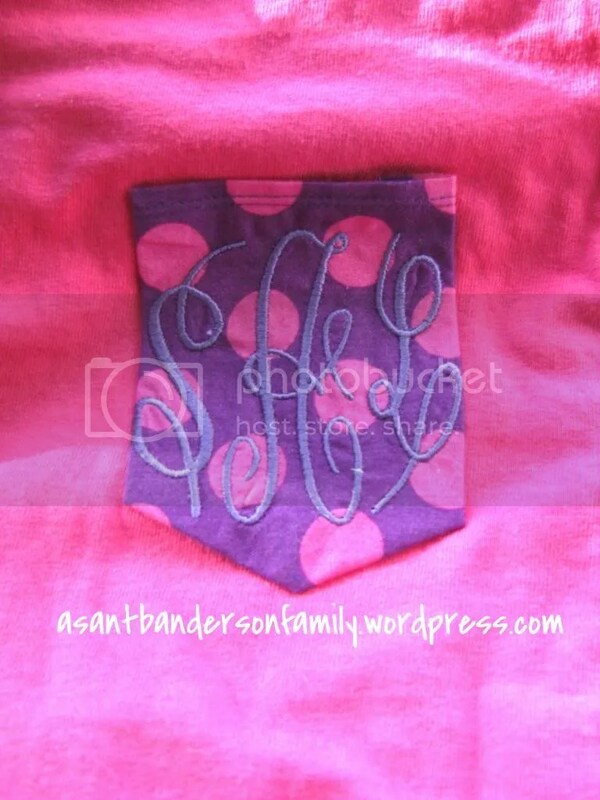 I also bought a good many t-shirts for myself in different colors and I decided the pink one was the perfect color for this fabric to make myself a monogrammed tee. 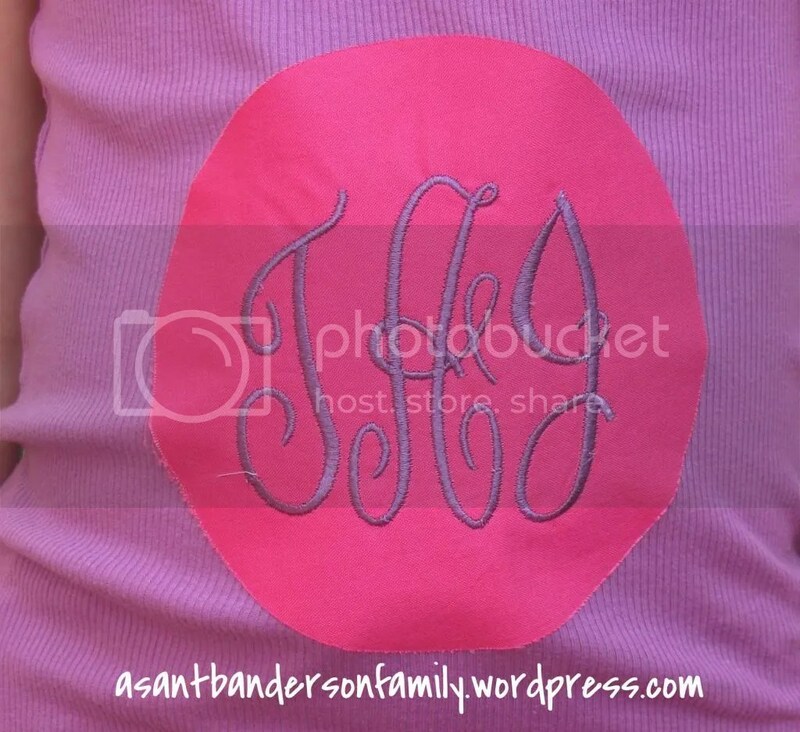 For the girls shirts I wasn’t sure about monogramming straight on the shirt and I didn’t think a pocket would look good so I decided to make a large monogrammed circle. Luckily I had some pink in my scraps from a quilt I made years ago that was just the right color. 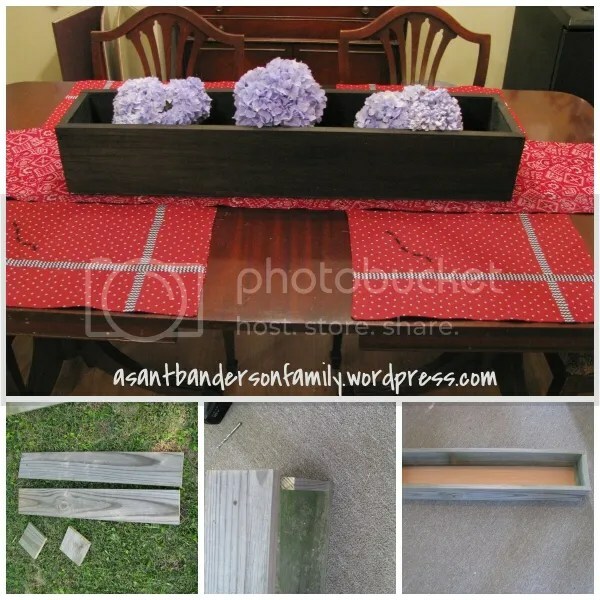 In case you missed it the results for upcycle are up on SYTYC. 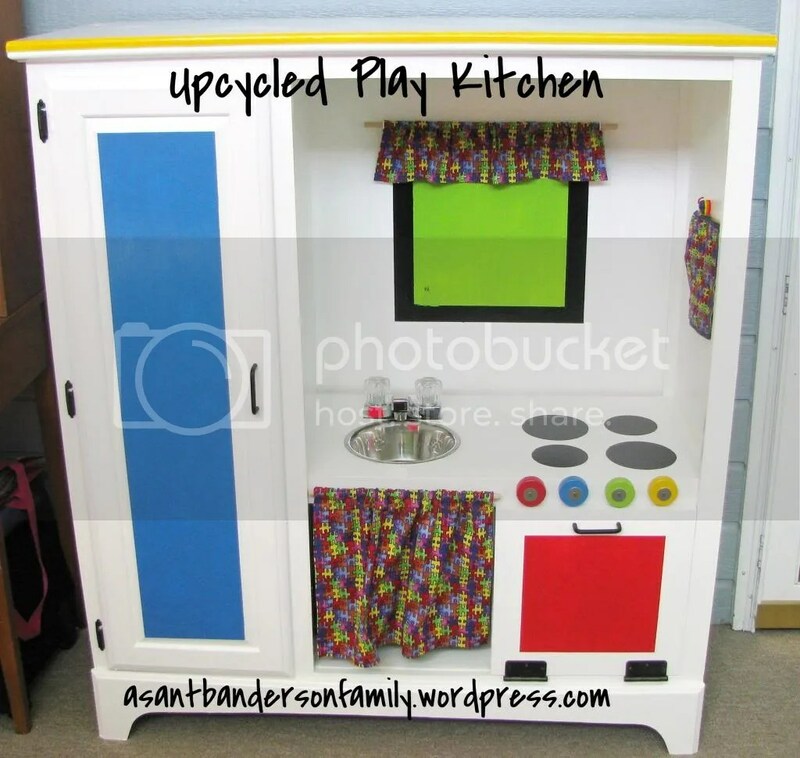 I came in 3rd place with my upcycled play kitchen. I have known I wanted to do one of these for Bradley since I was pregnant with him. The kids had a plastic one when they were little and I still had some of the food toys (not as much as I thought), but the plastic one just did not hold up well with active toddlers so I knew I wanted a nicer one made of wood for Bradley, but I didn’t want to spend a fortune so why not make one. So I did just that. I found this entertainment center on Craig’s List for $10. They even gave us a TV with it but we have it to someone else. Adam helped me with this project a good bit. We started by taking off the backing and removing the drawers and shelf. I was hoping to use the shelf for the bottom since under the drawers was open, but it wasn’t quiet big enough. I bought a piece of wood for the bottom. Then we used a piece of wood we already had to divide the bottom in half. Then we cut the shelf to make the oven door. Once we had all the wood cut Adam added some screws in it to tighten it up. It was pretty wobbly before we did this. Then he cut out the hole for the sink and the faucet. Then I puttied all the holes and deep scratches in the wood. Adam and I sanded the entire entertainment center till it was smooth. I bought some new hardware for the refrigerator door and the oven door at Lowe’s. I actually made several trips to Lowe’s before I had the hardware worked out. Adam predrilled the holes for the oven door and refrigerator door. The new handle for the refrigerator required two holes instead of one. Once we were done predrilling all the holes I put two coats of grey tented kilz on the entertainment center. The next part was the hardest. I decided I wanted the kitchen to match my other items in the sunroom, you can see them in my kid friendly decorating post. At first I thought I wanted to paint it black and use red, blue, green and yellow to accent the kitchen. But then I realized the accent colors wouldn’t cover over the black very well. Although I didn’t think about that till after we went all over town looking for Valspar black paint. The Lowe’s closest to our house was out of base c and had been for weeks. I had been in Lowe’s a few weeks before this project wanting to buy some black paint for another project so when I came back the lady was nice enough to look and find out how many each other Lowe’s in the area had of base c. Anyway, after deciding black was not the way to go I decided I was going to paint each section a different color. I started by painting the stove area with a coat of red. But while it was drying I decided that was tacky and was not what I wanted either. So I reprinted it with kilz and decided I’d use a base color of white and accent with red, blue, green and yellow. I had almost a full gallon of white from when we built Bradley’s bedroom and it was semi-gloss as well. Perfect!! I put two coats of white paint on the entertainment center. Then Adam used painters tape and taped off the oven door, the refrigerator door, the stripe across the top and the window. I had also bought a piece of wood for the backing but I didn’t attach it till after all the painting was done. Originally I wanted the window to have a black frame and plus sign so it would look like a window but then I decided that I’d probably mess up the paint so I simply went with the black window frame. I painted several coats of paint on the refrigerator door, the oven door, the stripe across the top and the window. If you remember when I bought these colors a while back I bought flat paint so instead of buying more paint I used them and when it was dry I put a coat of mod podge over it to give it the glossy look. I also bought some wooden wheels from Hobby Lobby and I painted one red, one blue, one green and one yellow. I wanted them to spin like real knobs so I got some washers and nails to attach them. Not my best idea but it worked. We will probably figure out a better way to attach them later. For the oven eyes, I used my Cricut to cut out some black circles. 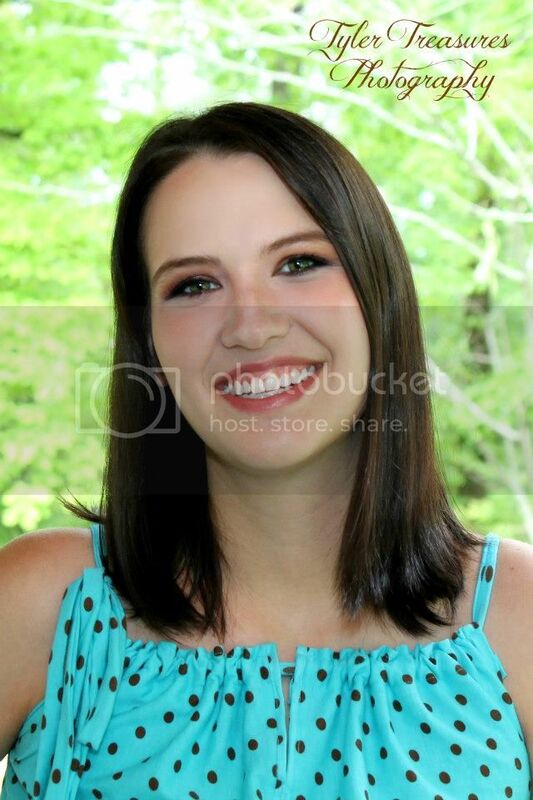 I cut out several sizes ranging from 3 to 6 inches. I believe I ended up using the 4 and 5 inch circles for the eyes. I wanted it to look as real as possible so I made two different sizes. 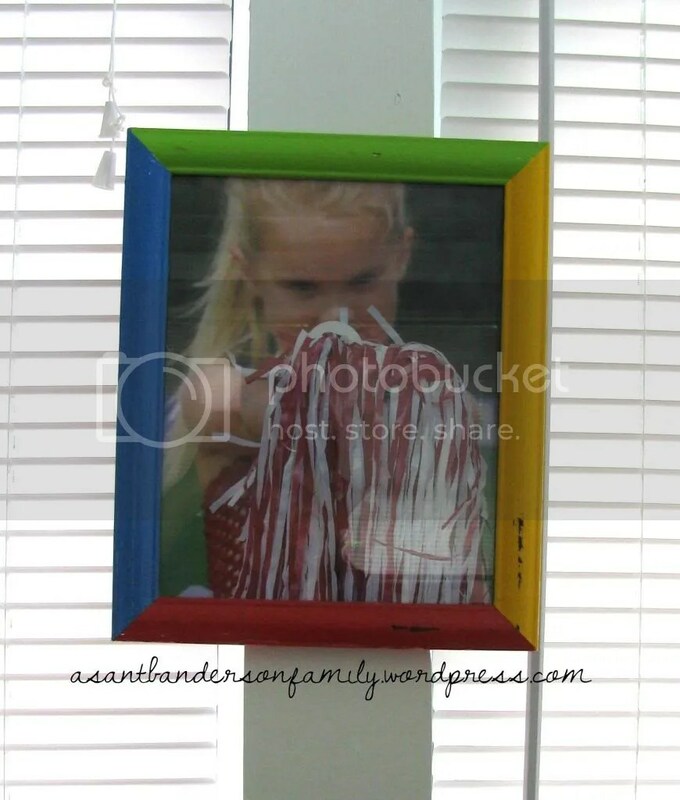 I used mod podge to attach the card stock to the entertainment center. I bought a metal dog bowl and faucet at Wal-Mart. Originally my plan was to buy a new faucet for our kitchen since it leaks and use the one in our kitchen for this project but they are expensive and it was out of my budget for this project so I went with a smaller cheaper one for the play kitchen. At first I put a bead of glue under the lip of the bowl and put it in the hole we cut, but slowly the glue was dripping and making a huge mess under the sink. We added a bead of white caulk around the top of the bowl and along the seams of the wood. Some of them had small gaps from the wobbliness of the entertainment center. I felt like this really helped give it a finished look. Then we simply attached the faucet with the pieces that came with it. Once all the paint was dry we attached the oven door and refrigerator door. The oven door also has a magnet at the top to help hold it together when it closes. Then we attached the backing. I wanted a curtain to hide under the sink but I wasn’t sure how I wanted to attach it. I had the idea of a dowel in my head but I wanted to be able to remove it too. I had these red hooks from when I was going to hang a dowel to hod ribbon, which I obviously never did, so I decided to use them to hang the curtain. I only had three and I needed four so back to Lowe’s we went (my kids were really good sports about all our trips to Lowe’s and Hobby Lobby). It’s been over a year since I bought the red hooks and I wasn’t able to find anymore red ones but I did find some white ones the same size. So I used two red ones for the curtain under the sink, two white ones for the curtain over the window and one red one for the pot holder. Fabric to match this project was a pretty easy decision. Earlier this summer I made the kids all a summer tote and I wanted a color that had red, blue, green and yellow in it and wasn’t too girlie. In this case I wanted the same thing so we went to Hobby Lobby and got some more puzzle piece fabric. I measured my width of each opening and doubled it for the width of my fabric. For the length I measured my length then added a few inches to it for my length. When I was done making my curtains I had a good bit of fabric left so I decided to make a quilted pot holder. I did this with the same idea of putting a quilt together. 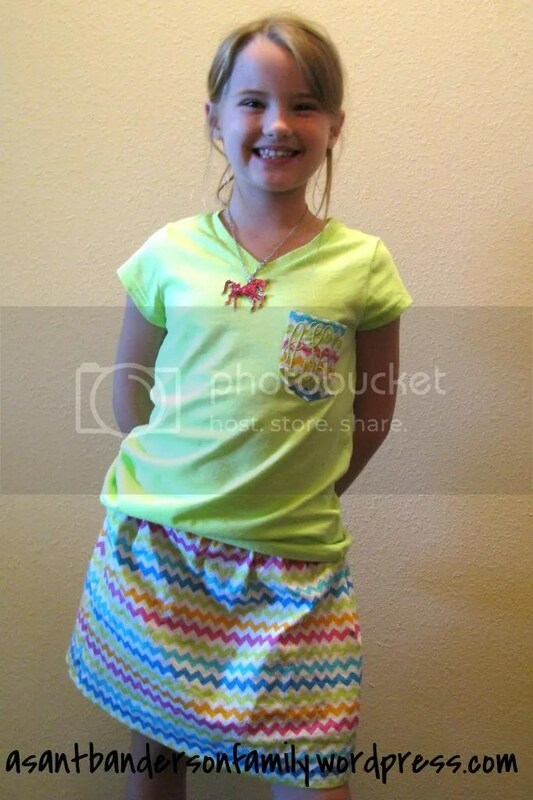 When I bought the fabric I also bought some rainbow ribbon to match so I used the ribbon for piping. Have I mentioned that I did this at 2 am? Yes, I couldn’t sleep thinking about my project so instead of staying in the bed and risking waking Adam up I went in the sunroom to work on it and it was after 2 am that night before I got in the bed. Then I needed something to store all the food in so we loaded up and went to Dollar Tree and looked for some baskets. I knew they usually carry a variety of baskets in multiple colors. I lucked up and they had one in each of my four colors in one style basket. I really wanted some that looked like the baskets at the grocery store but they only had those in three of my four colors but I went and head and grabbed them. Hopefully I’ll find a yellow one in there later. The kids helped me divide and organize the food in the baskets. They had already been organizing it based on food groups so we basically followed that same idea. Now we have a really cute play kitchen. The big kids all love it and Bradley is getting more and more interested in it. 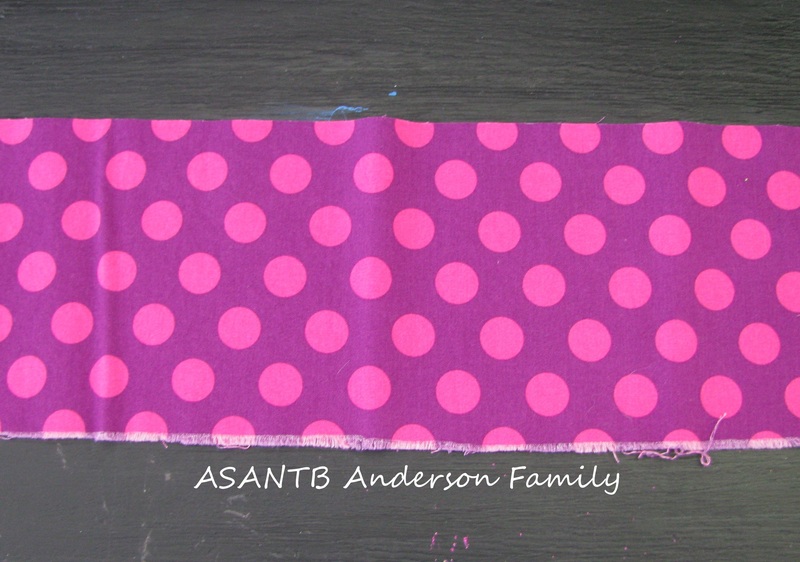 I have some left over fabric so I am debating on making some place mats for the table. 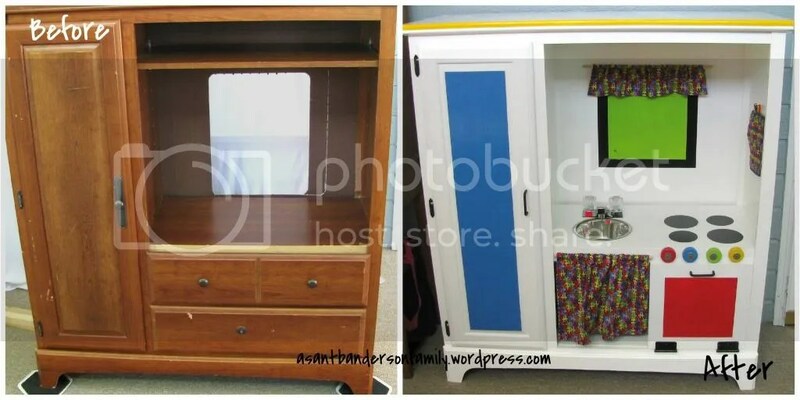 I know I want to buy some more kitchen toys but since I don’t have anywhere good to store them I am thinking about getting the bookcase at Hobby Lobby that matches the table and chairs. 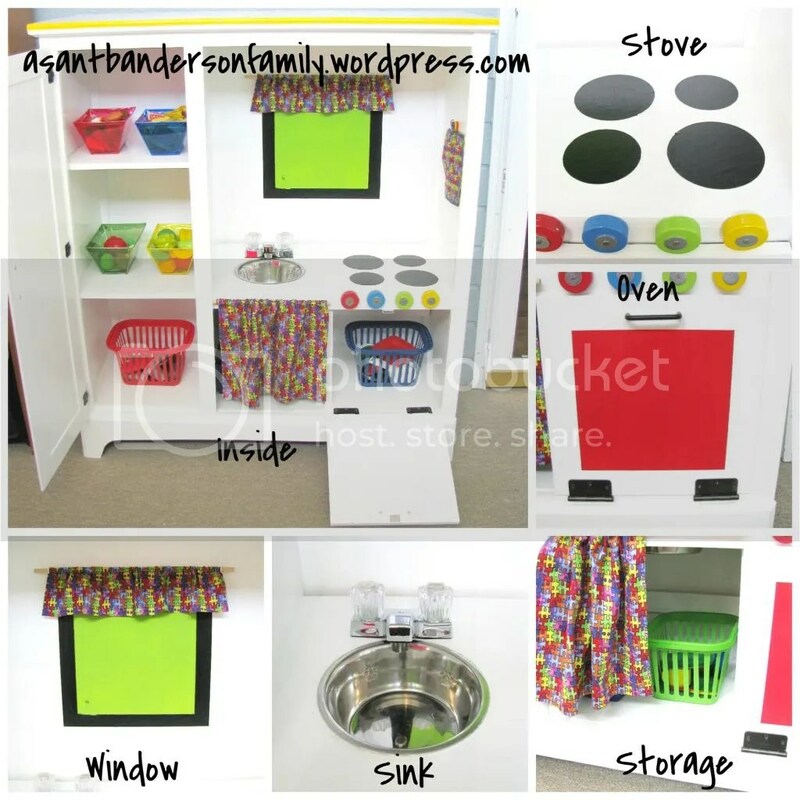 I want to buy some small appliances for the play kitchen. Also I saw some stuff that I like for when Bradley gets a big boy room (thinking way down the road) that uses the same colors so I could even move it in his room later. In case you missed it the results for the paint projects are up on SYTYC. 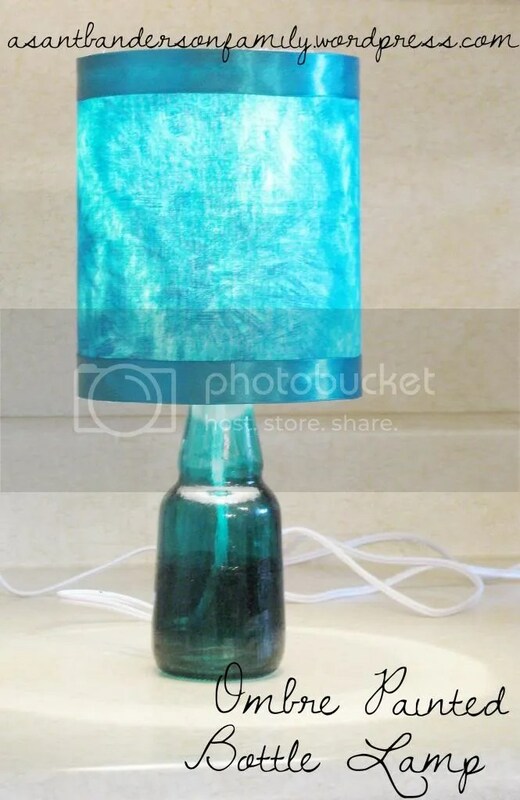 I came in sixth place with my ombre painted bottle lamp. I made this project to go in Noah’s room. He decided he wanted his room decorated an undersea theme so everything in his room is a bluish green color. Since it is made to look like the sea all the colors are not the exact same. I mixed the paint for the bottle with some neon colored food dye and mod podge. I used the neon green and blue and just added it and mixed it till I had a color I liked. I mixed it in a baby food jar so I could easily save the left over and who knows I may use it for something else in Noah’s room. I started out with a clear bottle and then I painted two coats of the paint on the entire bottle. Once that was dry I painted two coats of the paint from the neck of the bottle down. Once that was dry I painted two coats of the paint on the bottom half of the bottle. Well, I let it dry between each of the two coats also. 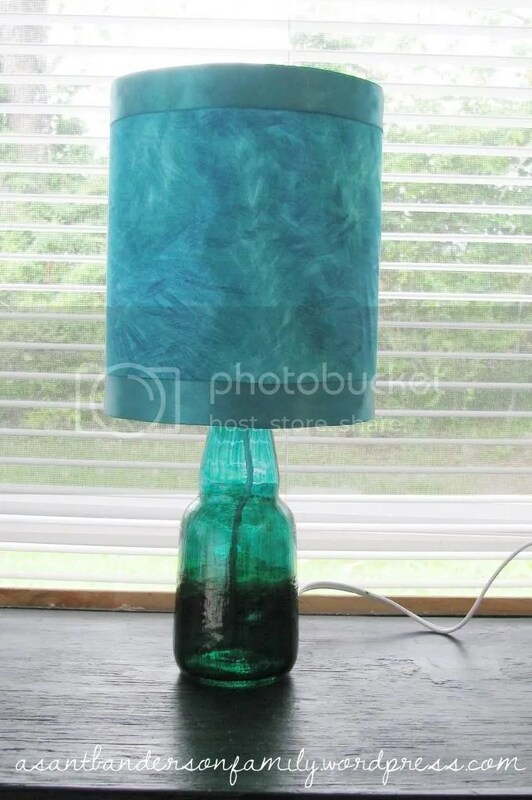 Once it was dry I used some parts I got at Lowe’s to make a lamp from a bottle. Then I added a lamp shade. This was a trick. I bought three different lamp shades before I found one I was happy with. The first one didn’t fit so I took it back and got a different one. With the second one I decided to paint it before I really made sure I liked the shape of the shade on the lamp. Not sure what I was thinking. But between deciding that paint it was not the way to go and deciding it didn’t fit the lamp well I had to go back to Hobby Lobby to get a third lamp shade. 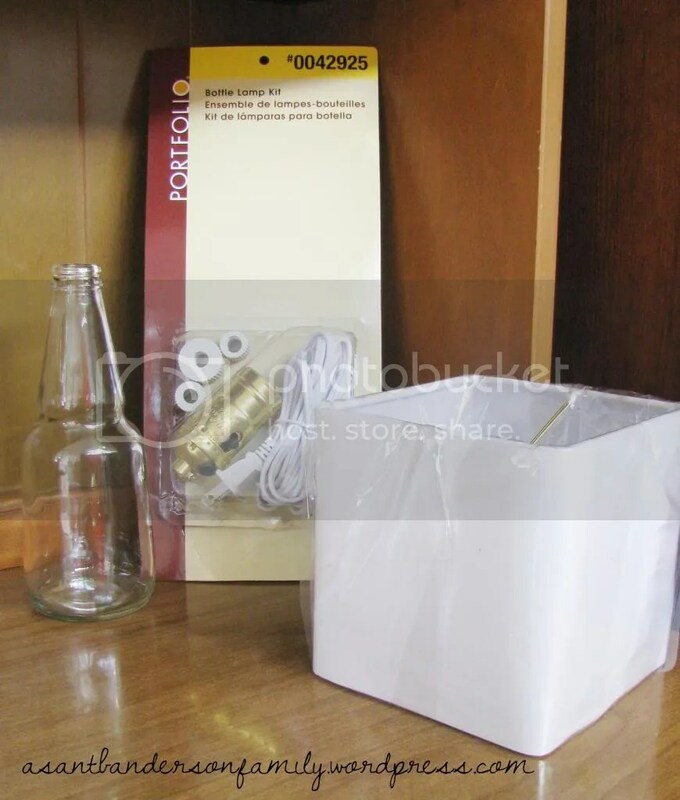 At this point I had debated on using a different bottle altogether so I didn’t take the lamp with me to Hobby Lobby. I picked out a lamp shade and I decided instead of painting it I was going to cover it in fabric and use ribbon for the trim. I found some fabric that looked like water and was bluish green. Again it didn’t have to match exactly but it looks really well with his room. I got two different ribbons and surprisingly both of them matched the paint I bought exactly. 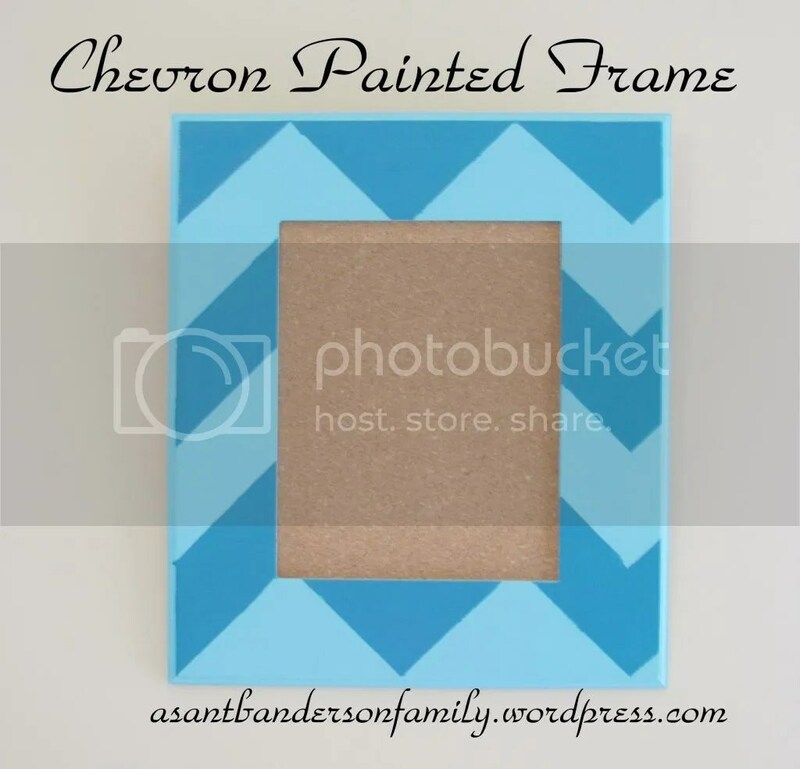 You can see the paint in the Chevron painted frame project I made for Noah’s room. Now Noah has a cute new lamp for his room. I have fabric to cover one of his throw pillows and the cushion for his bookcase seat. I have a few more projects for his room and it will be complete. Thank you to everyone who voted for me last week on SYTYC and don’t forget to head on over there again this week to vote for your favorite project and I can’t wait to tell you next week which one was mine. 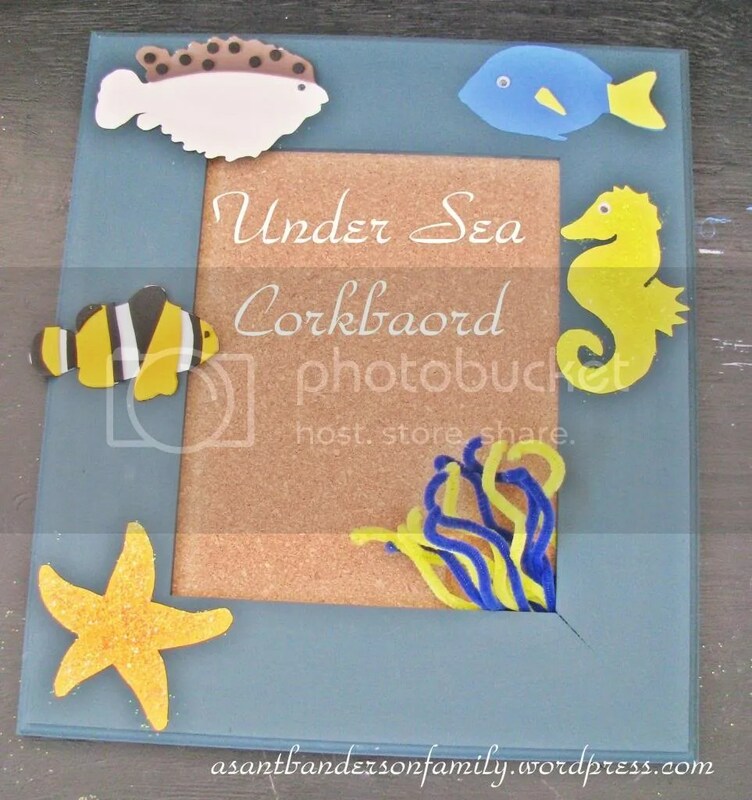 A while back I made an under sea corkboard for Joann’s Create with 8 contest. While I liked the frame, the more it hung in Noah’s room the less and less I loved it. 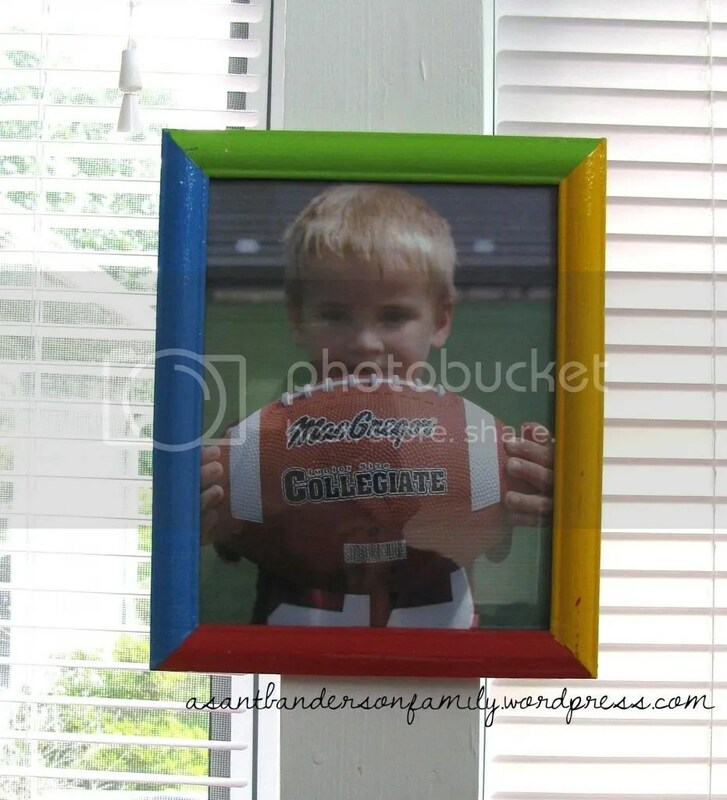 After making this frame I choose colors for his room that were slightly different than the background color of the frame and my OCD kicked in. I had already decided I wanted to make another frame but I am still not completely sure what I am going to as far as the other frame. So that will be saved for another day. Last week while all three big kids were gone I worked on several projects and this frame was one of them. At first I thought I only wanted to repaint the background to match the colors of his room, but taking off the fish was less than an easy task. I can’t remember what I used to attach them, but it held really well. So well, that I got to use my new sander for this project first. After pulling as much of the fish off as I could I used my sander and made the frame nice and smooth again. Then I painted the entire frame the lighter of the two colors I choose for Noah’s room. I finally decided I was going to give it my best try and attempt a chevron paint pattern. 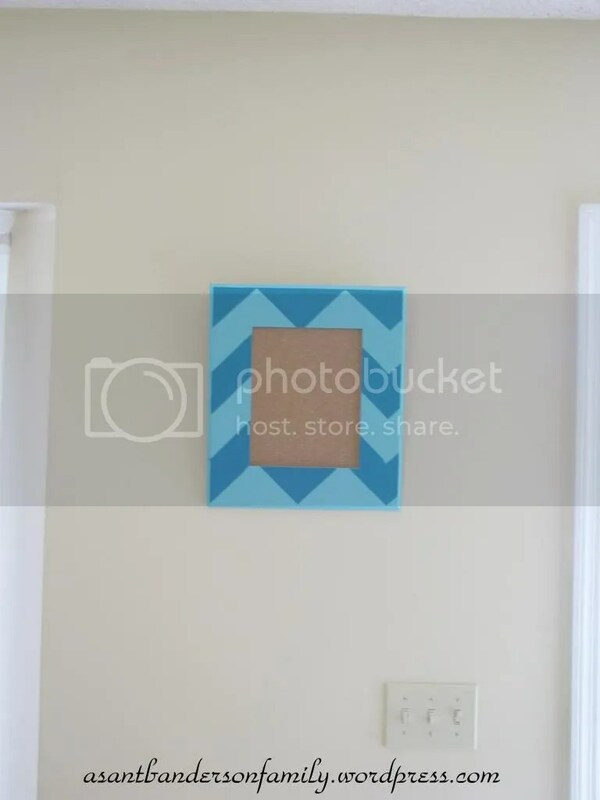 After reading many different tutorials online I decided to use a little bit of this idea and a little bit of that idea to tape of my frame. 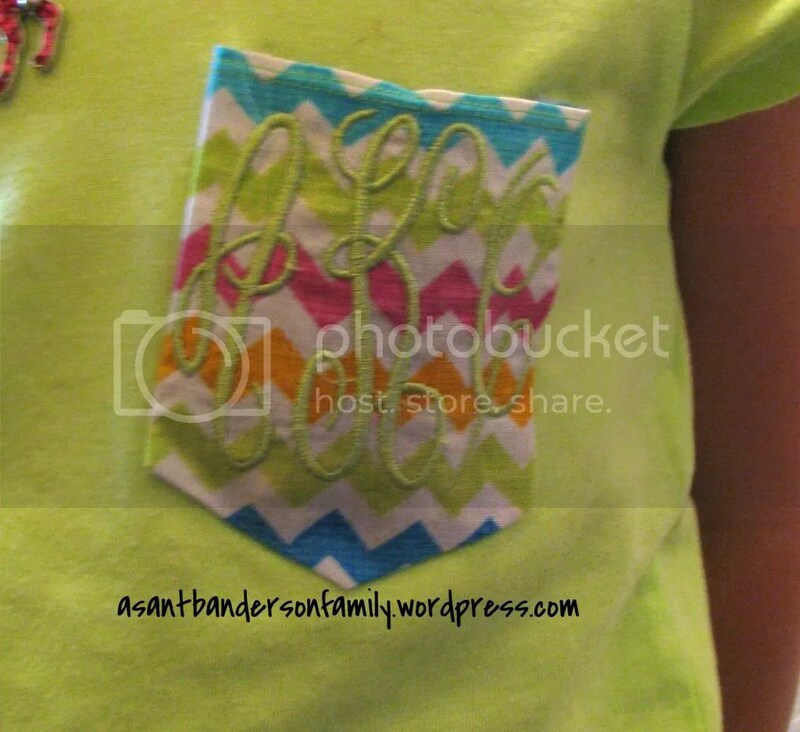 I am not going to give you a tutorial on how to paint a chevron pattern here since there are so many of them out there already. Then I painted the dark of the two colors (which is also the same color as Noah’s accent wall). When I was done I still did not love it. As time has gone on and I have looked at it more and more it is growing on me. But I feel like the corkboard center takes away too much of the chevron design. Don’t be surprised if in the next few weeks I decide to sand it and start over again. A few days ago I posted a picture of Bradley on Instagram and several people commented on the bookshelves in the background, so I decided I’d do a recap of some of the projects for our sunroom. When we first moved into our house the sunroom was our children’s playroom. 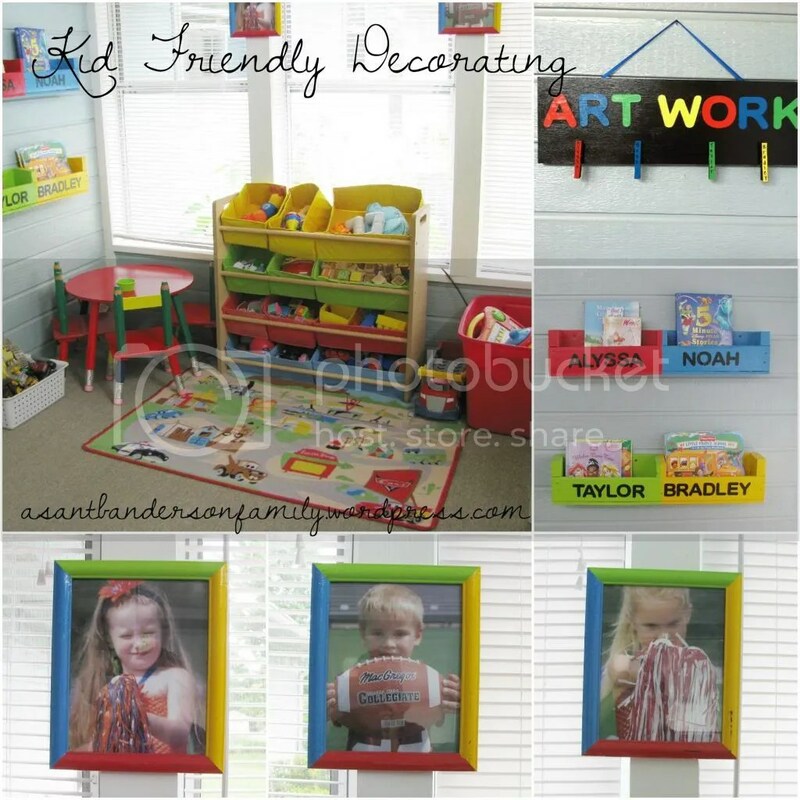 Over time that has changed and now we simply have a play area in Mommy’s craft room. But the color scheme is still the same. You see having boys and girls I wanted it to be something that was neutral but still fun and playful. I had seen this table and chairs at Hobby Lobby and it was what inspired the decoration of this room. Hobby Lobby also has a bookshelf and coat rack to match but they aren’t needed in my area. Later I was looking for something to organize the kids’ toys in and I found this cute set up at Wal-Mart. I am not as fond of the basket now as I was when I first got them. They haven’t held up as well as I would like so I am planning to get some different baskets in the future. Hopefully I can find some plastic ones in the same color scheme that will fit. I realized when preparing to write this recap that I never did a post on the first project my husband and I did for the sunroom, the picture frames. I will tell you more about them at the end of this post. The next project I did for this room was the Artwork display. It has been a year since I made the artwork display and while I still love it I have learned a few things about it. 1. 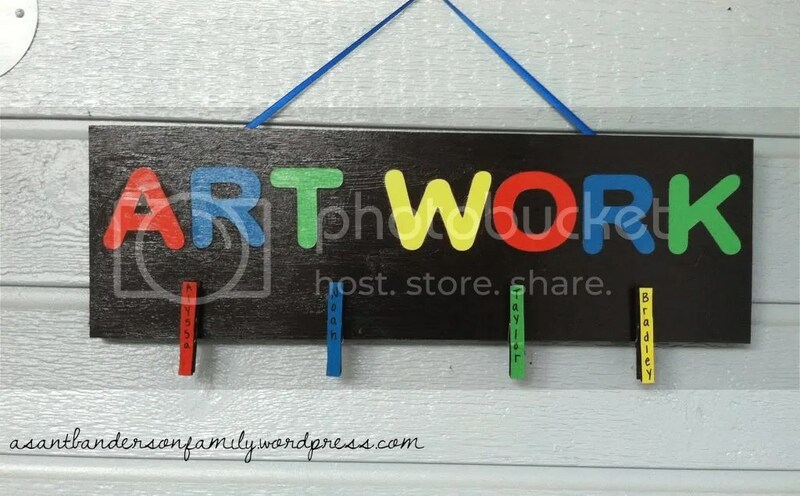 My oldest daughter has made lots of stuff to hang on it and I had to reattach her clothes pin. The hot gun didn’t hold up well over time. 2. The sun has faded the cardstock from the lettering, but it still looks nice. 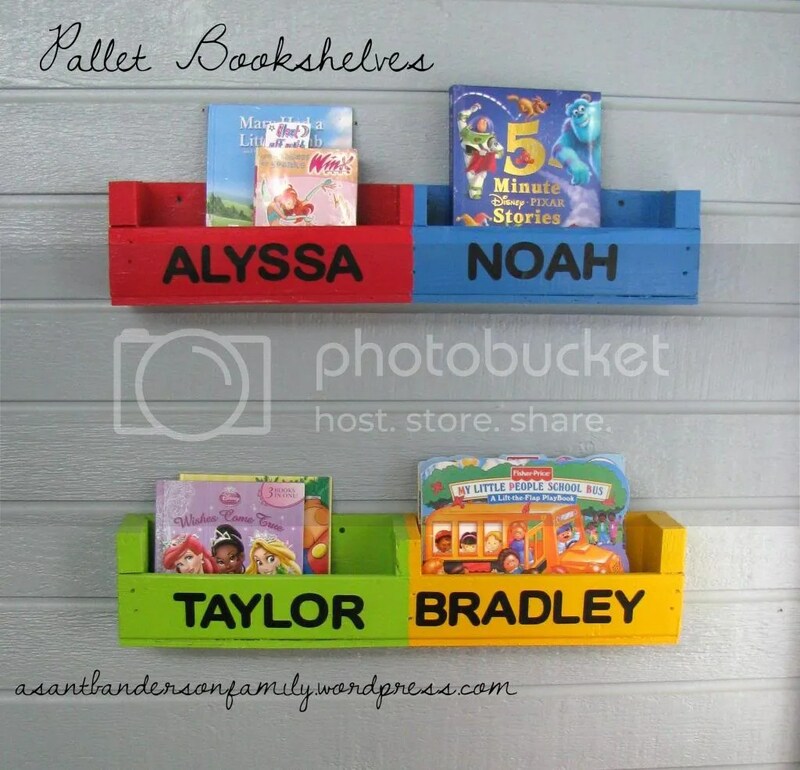 The last project I want to feature in this post is the Pallet bookshelves. It has also been a year since I made them and I still love them. They don’t hold a bunch of books but its prefect for each child to have two books in the sunroom and the rest of their books in their rooms. 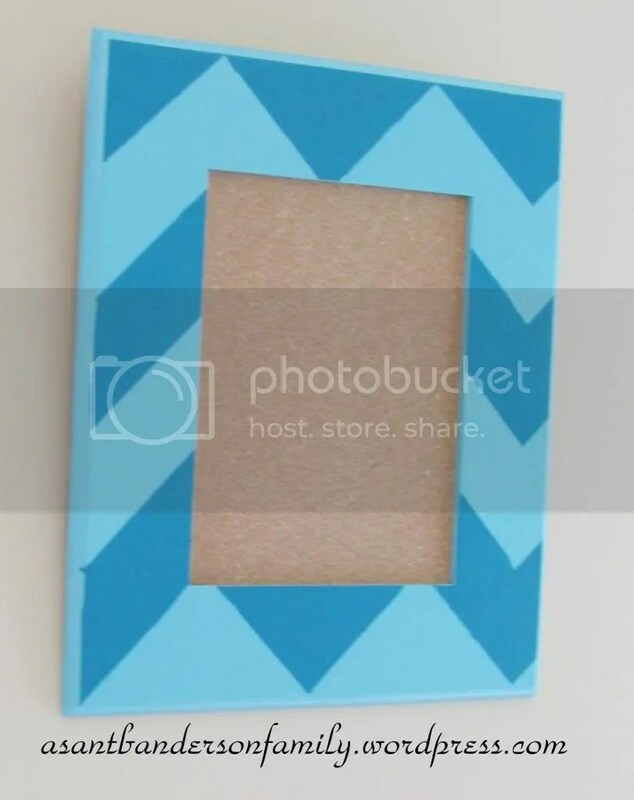 As far as the picture frames go, I looked and looked for something that I liked to match the color scheme and I couldn’t find anything. 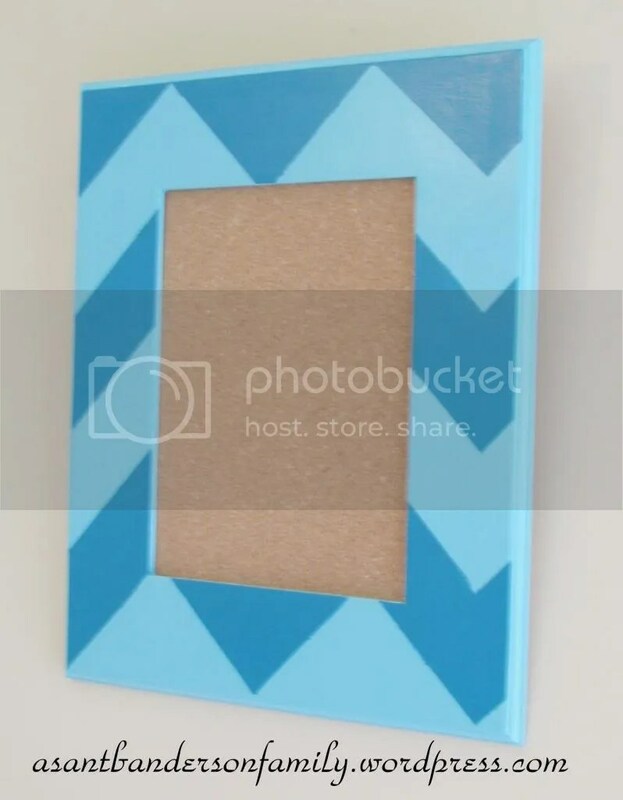 So I decided I wanted to paint some picture frames so that each side was a different color (red, blue, green and yellow). Adam did this for me. He taped off two sides and painted the other two sides, then when they were done he taped off the sides he painted and painted the other two sides. When I bought the paint I wasn’t thinking and I bought flat. So when I made the artwork display and the bookshelves, I put a coat of mod podge on the picture frames to give them more of a finished look. They have gotten messed up some over the years but for the most part they still look good. 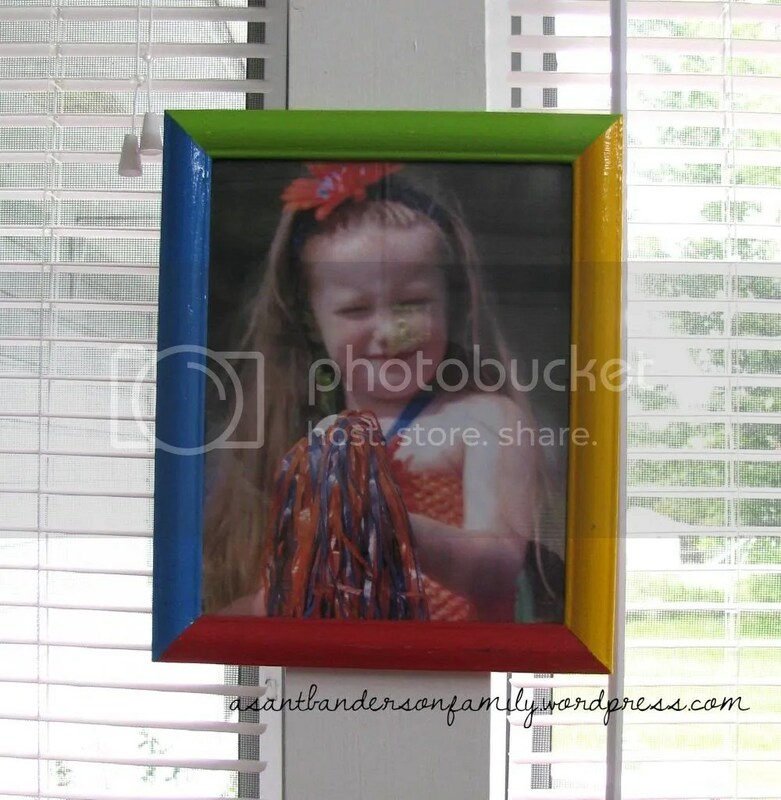 The pictures of my children that are in the frames were done by Mandi Hutchenson Photography. If you are in the Birmingham area and looking for someone to take pictures of your family make sure to get in contact with Mandi, she does a wonderful job. My oldest daughter loves ballet flats. They are her absolute favorite shoes. I usually can find them on clearance at Target but now that I don’t work in the office everyday I don’t get to go in Target as often to check out their clearance. The one thing I really hate about them is they mess up so quickly so unless I can find them on clearance I don’t buy them. Her and I both had a pair of ballet flats that were ready for the trash. Mine were black and the toe was messed up on one of them. Hers were pink camo and were so dirty and worn out looking. 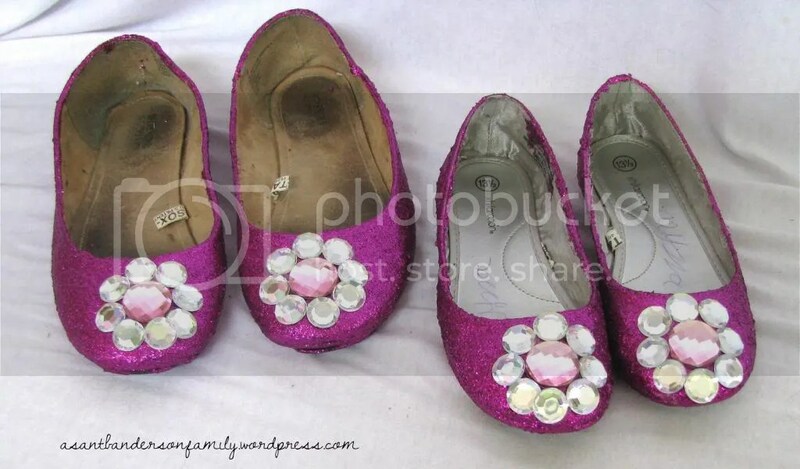 I had this other pair of glittered pink ballet flats I had bought for my youngest daughter so with my love to match and coordinate I decided I’d attempt to glitter mine and my oldest daughter’s worn out ballet flat instead of just trashing them. I have seen so many pins on Pinterest where people have done it so I didn’t see why I couldn’t do it too. I started out with these awful looking shoes. I am still working on remembering to take pictures along the way when I do something so please forgive me for the lack in before picture. I had glittered one of each of our shoes when I realized I didn’t take a before picture so I have two separate pictures of one shoe for a before picture. First I painted mod podge and glitter all over them. The glitter on the shoes I bought it a little bigger pieces than the glitter I used when I made these shoes but the color is almost exact. 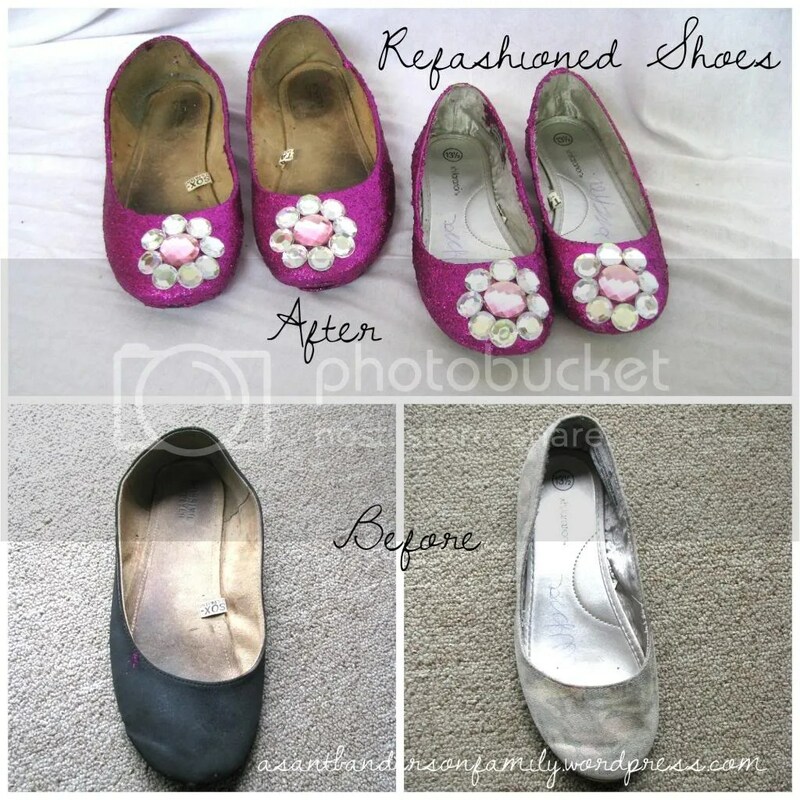 I prefer the fine glitter so I bought the fine glitter for the shoes that I refashioned. I used a baby food jar, marked 2/3 of the way up the side and 1/3 of the way up the side then I used 2/3 glitter to 1/3 mod podge. The first coat about completely covered them but I had to do a little touch up on them. 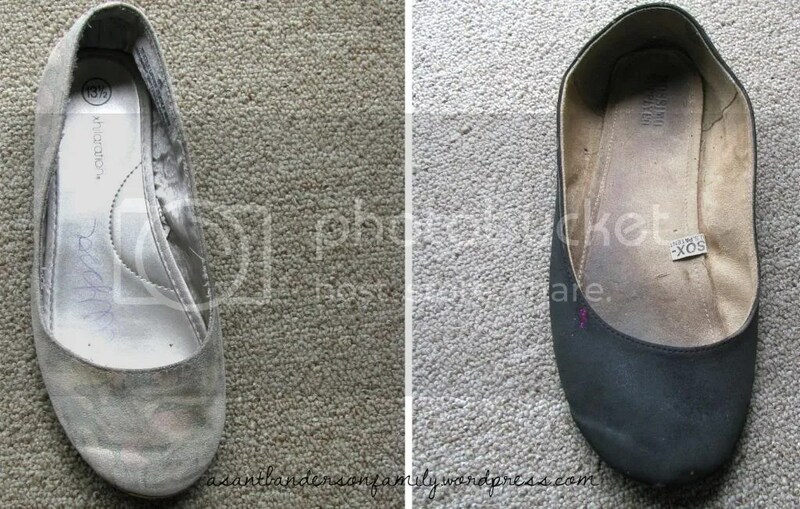 It pretty much used all of the mixture for the two pairs of shoes. The insides still look worn and the shape of them didn’t go back to normal but once they are on they look great. My daughter isn’t here to model them this week so this will have to do for pictures. 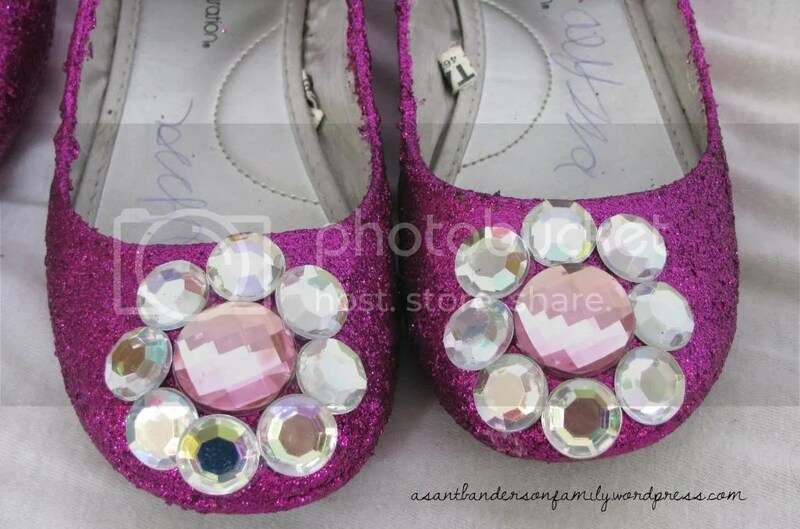 The shoes I bought for my youngest daughter also have gems on them that are clear, gray and pink. I didn’t think to take one of the shoes with me when I went to Hobby Lobby to purchase gems. So I decided a flower would look good on the toe of the shoes I was refashioning. I bought 25 mm pink gems and 16 mm clear gems. I used a pink gem for the center and the clear gems for the petals. First I laid them out on the desk and then I attached them to the shoes with hot glue. It probably wasn’t my best decision but I didn’t think about buying and E6000 glue before I started this project. If I have to reattach any gems then I will use some E6000 glue. 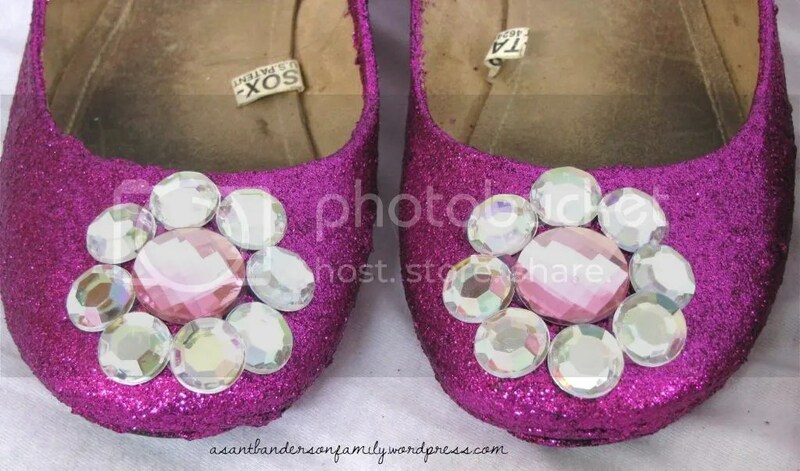 The one thing about them is the glitter around the tops is a little rough so they must be worn with socks but other than that I was very pleased with the outcome of the shoes. 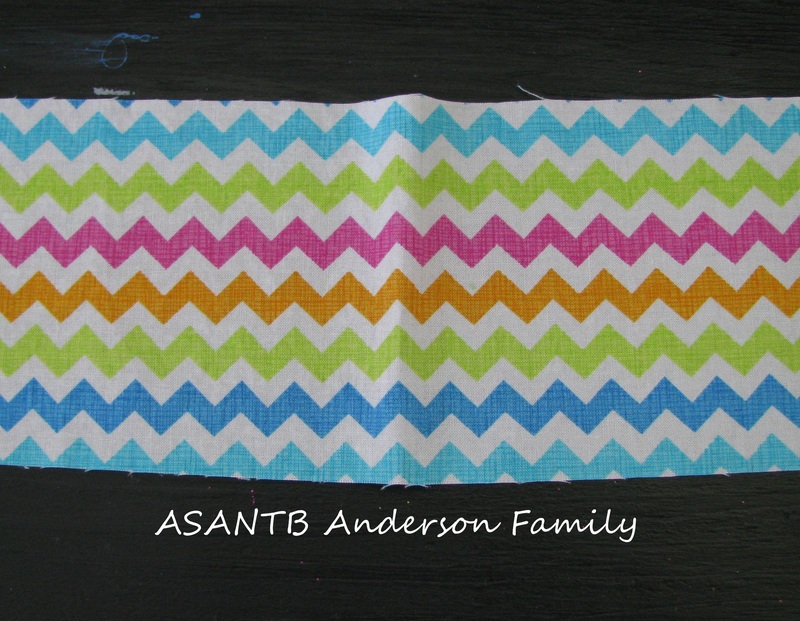 You ask what does ASANTB stand for well its really fairly simple, its our family.